Because I am a Christian man and a business leader, there are certain things that I know will always be true and there are other things that I believe as a matter of faith. For example, I know the truth that all people will make mistakes. I know that we are all created uniquely by God for a specific purpose. I know that people who lead lives focused on living out the purpose of their unique talents have far more satisfying lives than those who never figure out why on Earth they are here. I know that we need teachers, peers and students to teach each other and improve ourselves. I believe that Jesus was the greatest leader who ever lived: he took a small group of seemingly unprepared people and taught them for about 3 years, resulting in the greatest transformation of all humanity that has ever taken place. I believe this type of true servant leadership is all too rare. I believe each of us is being shaped by God to make a unique and ultimate contribution (Ephesians 2:10). The question isn’t whether God is at work, but knowing how to better recognize (1) what God is at work doing and (2) how to set a path to align with His work. I believe my business would be more successful if it was filled with leaders with this type of clarity, focus and mission. I believe that individual renewal will lead to corporate renewal. I will be in charge of many of the Lord’s things for which he has given me talents. Creating a Christian family devoted to his service. Leading a Christian company that serves as an example to our employees and others in our community. Teaching and mentoring others in my Church, my Family and my Company. Since the time I wrote that, I have become President of Spartan Logistics, worked on a church building project, developed over 3 million square feet of warehouse distribution space to serve the needs of our clients, and raised 2 children to the ages of 18 and 20. Our company has tripled in size, scope and complexity, but the team I have to service the growing demand for logistics services has evolved to meet the challenge. We have learned to hire, fire, lead and operate around our 4 key values: Service, Teamwork, Integrity and Respect. Every year since I joined the company, I have led a “conference” for the leadership team in our company. 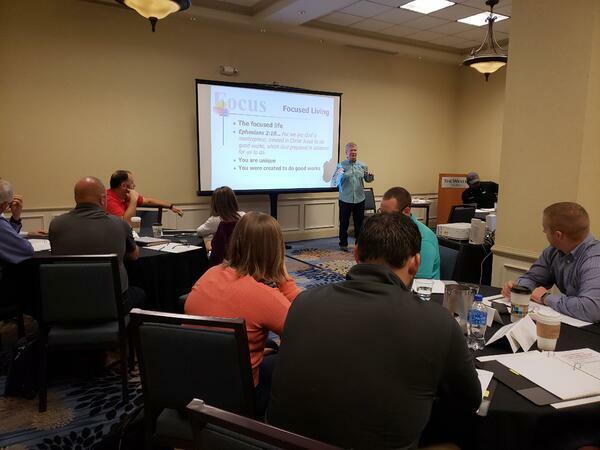 This has consisted of bringing all the leaders together from all our locations and spending 1-2 days reviewing performance, goals, objectives, strategy, challenges, leadership skills, budgets, safety, and other significantly important business topics. The real purpose was always to bring people together to build a high-functioning team, but I never told them that. This year for my 23rd leadership conference I have organized, I decided to do something completely different, challenging and really personal. I asked my pastor to conduct the focused living spiritual development plan with my team in a work setting. Broken into small groups, all of my team worked through their personal timeline to discover how the experiences of their life have shaped them. Based on where we have been, we explored and documented the focus, purpose and direction of each our lives. The end goal was for each person to leave with their own calling statement and a clear understanding of their unique purpose, values and vision. This was also the ideal time to review our company’s mission vision and values to make sure that we have alignment among the whole leadership team for the direction we are going together and the values that will take us there. Why would I bring God into a secular workplace? For me that question is easy. I believe the teachings of Jesus are true even if you do not. I believe that the word of God is useful for teaching and bettering our lives even if you lack faith in the creator. I believe everyone is created uniquely for a purpose even if they don’t. I believe the values of the Christian faith align with our company’s values: we exist to serve others; we work together as a team for a purpose according to our unique shape; we conduct ourselves with integrity; we will interact respectfully of others as equals in all things. I want to teach and support my team the same way I have been taught and mentored- this sacrificial leadership is the key component of building a very effective team. Like any opportunity to learn, individuals will take out of an experience in proportion to what they put into it. I observed that most of team was highly engaged with each other, their experience, their faith, and their God- given purpose. Those who finalize what was started and apply to their lives have an opportunity to do something rare and awesome: understand their purpose and live it with passion. My sincere prayer is that we all become leaders operating at this level.